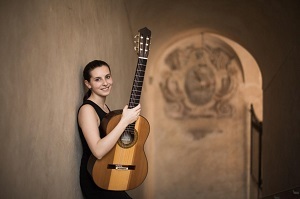 Carlotta Dalia, born in 1999 in Grosseto, started studying classical guitar at the tender age of 8. She has already participated in major public performances at numerous festivals in Italy and abroad, holding her first solo recital at the age of 12 and taking part in countless national and international competitions. Her expressive capacity and her extremely high level of technical accomplishment and musical understanding make Carlotta a phenomenon of excellence.